Originally from Mexico, the Perpetual Adoration Sisters of the Blessed Sacrament made the Diocese of Sioux Falls, South Dakota their home more than 16 years ago. The Sisters spend their day-to-day lives inside the church, filling their time with prayer, reflection and community support. Since 2002, they have lived in temporary quarters in the old rectory of the Cathedral of Saint Joseph. The Sisters have accepted new members since joining the Diocese of Sioux Falls and required updated living facilities. 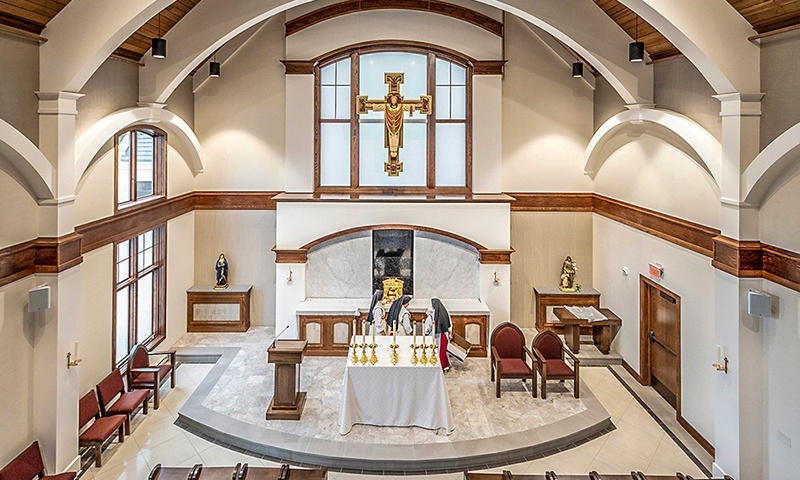 The Fiegen Construction team recently constructed a new chapel and monastery, enabling the Sisters to continue their holy work in the community. 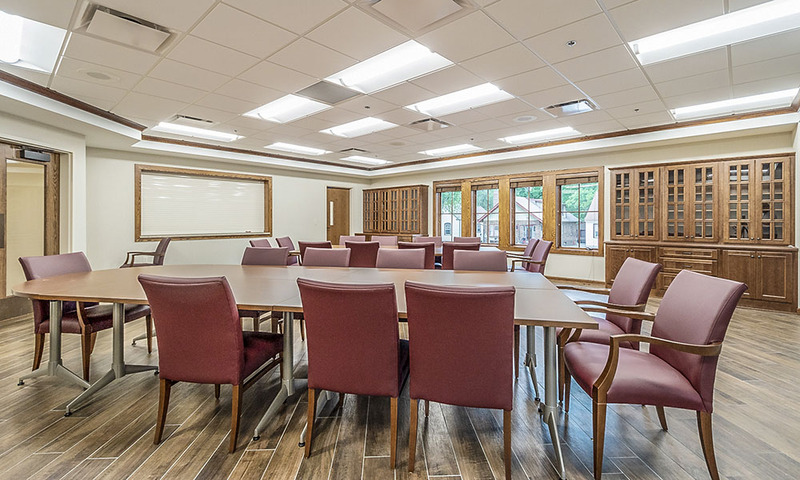 The new 26,000-square-foot building, named Mater Ecclesiae Monastery, is located at 707 West 4th Street and was completed in August 2018. The multi-story space features individual bedroom cells for the Sisters, a spacious dining hall, a sewing room, and an attached chapel. Though there are 11 Sisters currently living at the monastery, there is enough room for 24. The $5 million monastery was funded by donations made by the faithful from across the Diocese of Sioux Falls. The project was lead by Fiegen’s Project Superintendent Rick Larsen and Project Manager Jarrett Hallvin. Our team worked closely with CO-OP Architects in Sioux Falls and Bishop Paul Swain to provide the Sisters with a modern living space all while preserving the cultural heritage of their Order. The project involved demolishing and relocating existing structures and building the updated facility on the grounds of the Cathedral of Saint Joseph. Demolition can prove challenging on any job site, but it’s especially difficult when coordinating with its occupants. Efforts were made to ensure the Sisters were comfortable during their housing transition. Major overhead utility lines were also a challenge. Jobsite safety is always the top concern for the Fiegen team and the ongoing activity of the St. Joseph Cathedral campus made that even more important. Once the monastery was completed, our team was invited to celebrate and consecrate the new facility. Bishop Paul Swain blessed the new facility and ceremoniously closed the monastery gate, symbolizing how the Sisters will live apart from the outside world, but will continue to connect with its inhabitants through daily prayer and worship. The monastery is open daily for perpetual adoration prayer and services. "Having a new place and a bigger one, it means a lot to us. We have been praying for it and we have seen the answer of God to our prayer," says Sister Angelica Morales. Fiegen Construction was honored to have been involved in furthering the work of the Perpetual Adoration Sisters. For more information about the Perpetual Adoration Sisters of the Blessed Sacrament, visit their website.